Change Day is a social movement in healthcare sector that was started in 2013 by NHS in Great Britain and it has spread all over the world. The main idea in Change Day is to enable and inspire workers to change their work culture and environment towards being more efficient, open to initiative and customer-centered. The Finnish Innovation Fund Sitra is an independent public foundation which operates directly under the supervision of the Finnish Parliament. 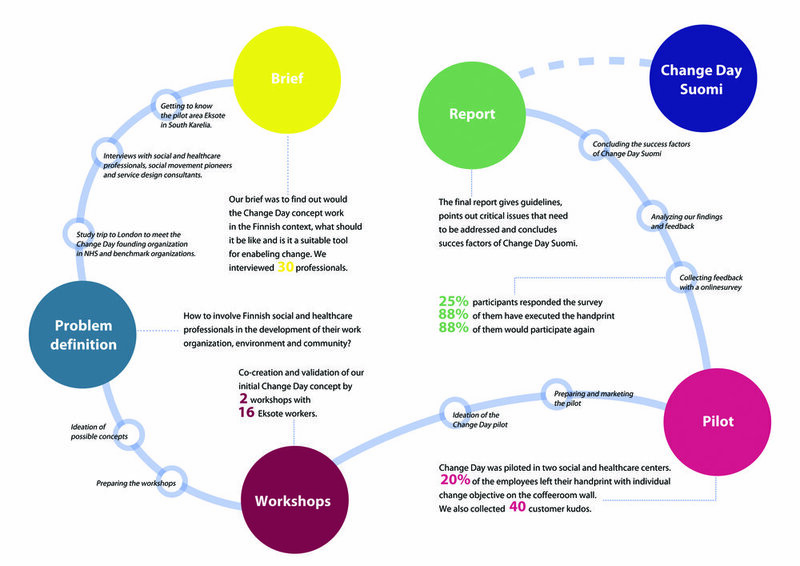 Our brief from The Finnish Innovation Fund Sitra was to find out, would the Change Day-concept work in the Finnish context, what should it be like and is it a suitable tool for enabling change. 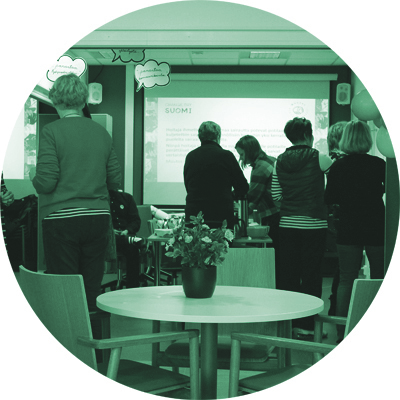 Our mission was to pilot the Change Day Suomi in the South Karelian social and healthcare area, Eksote, and collect data for launching a national Change Day in Autumn 2015. 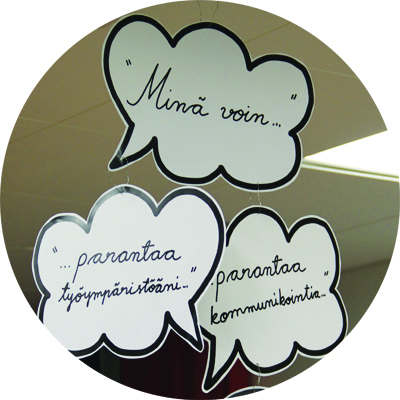 The question was: How to involve Finnish social and healthcare professionals in the development of their work organization, environment and community? Change Day invites everyone involved with health and social care to share their ideas and act on them. Inspiring others to take small actions will make a big difference. 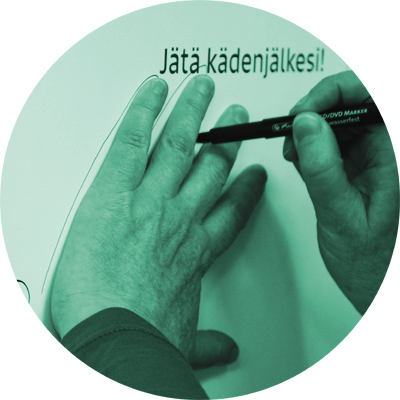 People can share their ideas for change at a physical event or online by leaving a handprint. 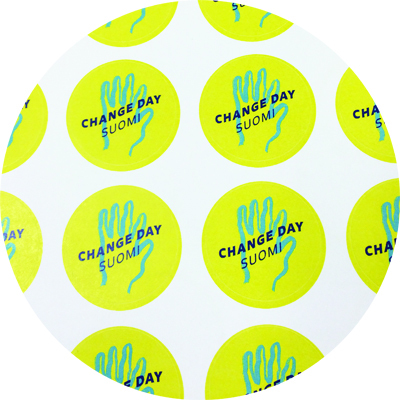 Change Day Suomi inspires people to create small changes, creates discussion and brings people working on similar issues together. Social and healthcare professionals are facing increasing pressure and expectations from the government and the general public. Budgets are getting tighter and the need for good care is increasing with an aging population. The professionals need an opportunity to have their say in what needs to change. Workshops: Co-creation and validation of our initial Change Day concept by 2 workshops with 16 Eksote workers. Pilot: Change Day was piloted in two social and healthcare centers. 20% of the employees left their handprint with individual change objectives on the coffee room wall. We also collected 40 customer kudos.